Perched on the slope of Santorini’s rugged caldera and above the picturesque fishing town of Ammoudi, luxurious hotel affords dramatic views, whether you’re taking in the scenery of white-washed churches or watching the sun set over the horizon. Spend time in your private pool and enjoy daily yoga sessions before winding down at Katharos Beach, which is a short walk away from the hotel. Popular attractions such as the Oia Castle, Skaros Rock, Baxedes Beach, and the Naval Museum are easily accessible from the resort. 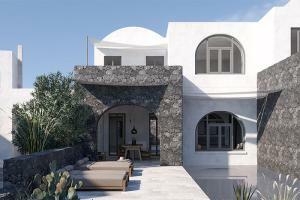 Situated just steps from Katharos Beach, and 7 miles from Thira Airport. Skaros Rock, Volcano, Archaeological Museum of Thera, Santorini Port, White Beach, Art Space Santorini, Ancient Thera, Santorini Water Park, are all a short ride from the resort.